Gung hay fat choy! As the Frock Flicker of Asian descent, it falls on me to wish you a happy Chinese New Year. We’re entering the Year of the Ram (or Goat or Sheep) today, which is supposed to be particularly peaceful and stable. Let’s hope so. This is also my birthday, although I was born in the Year of the Rooster, and people born under my sign are loyal, trustworthy individuals who are blunt when it comes to offering their opinions. You heard it here first, folks. 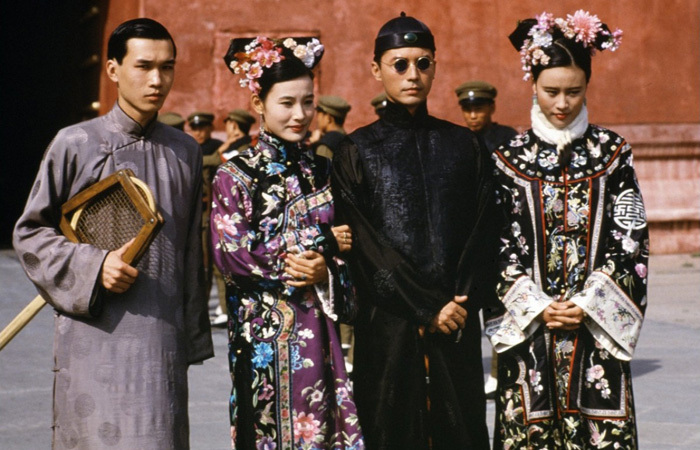 To go with today’s theme, I thought I’d throw back to an incredibly good and poignant movie, The Last Emperor from 1987. 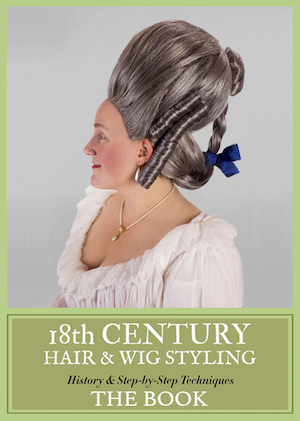 For starters, the costumes were designed by James Acheson, who won the Best Costume Oscar for this movie and also for Dangerous Liaisons (1988) and Restoration (1996), so you know he’s damn good. 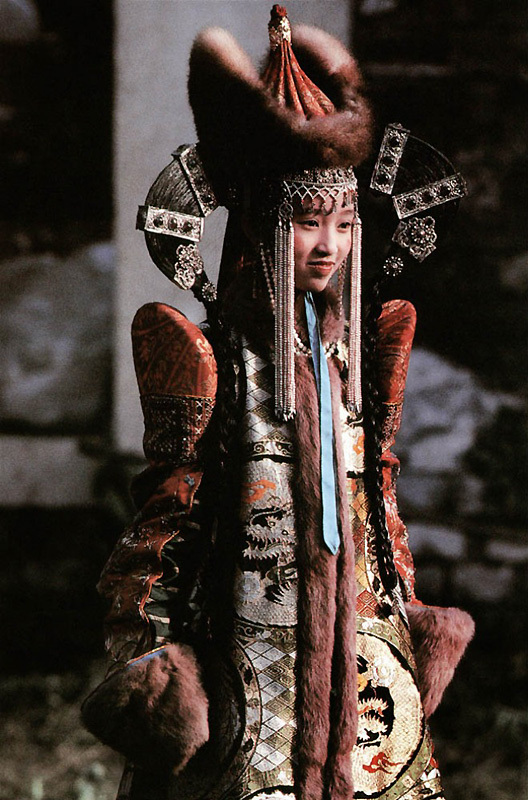 The majority of the costumes are traditional Chinese robes and gowns shown during the 1910s, and while I don’t know a lot about how historically accurate they are (sorry, ancestors! ), they certainly look stunning. The fabrics alone will set your eyes agog, they’re so rich and lush and detailed. This production didn’t skimp on the materials; frankly, they didn’t skimp on anything that shows. 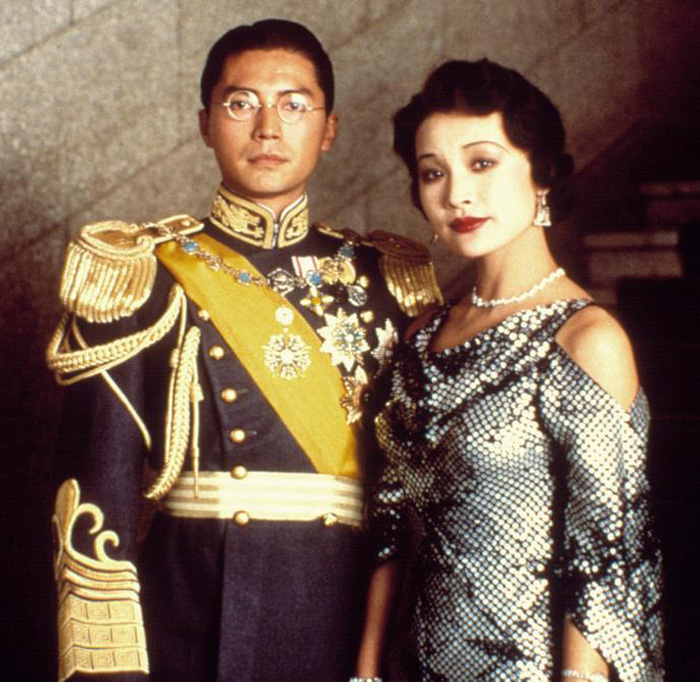 Where the film depicts the Japanese invasion of China, the emperor Puyi (played by John Lone), and his wife Wanrong (played by Joan Chen), wear Western 1930s clothing. These outfits too are elegantly done and include mostly military uniforms for him and evening gowns, cheongsams, and fitted suits for her. The Communist revolution part of the film in the 1950s is pretty grim, costume-wise, but it does the job. In addition to Best Costume, this movie won a boatload of Oscars in ’87 — Best Picture, Best Director, Best Screenplay, and a host of cinematography, sound, and editing awards. I don’t think this was all hype either. I saw the film in the theaters, and I’ve watched it several times at home. It’s an epic masterpiece in every way. 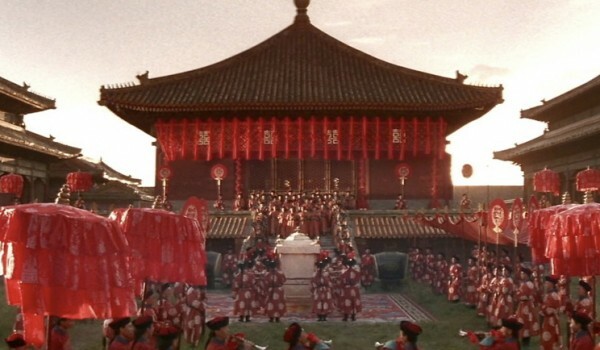 With many scenes actually filmed on location in the Forbidden City, where no Westerners had been allowed to film before, that gives the movie a real edge. The whole is beautifully crafted, tragic, and thrilling to look at. 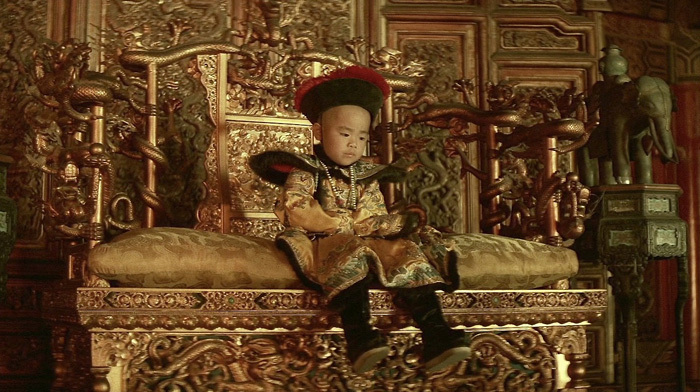 Yeah, it’s tough being Xuantong Emperor when you’re only 2, but LOOK AT THAT CHAIR, omg. It’s a lot of look, but done right. Tea, wickedly long fingernails, and epaulets that could put an eye out. As you do. 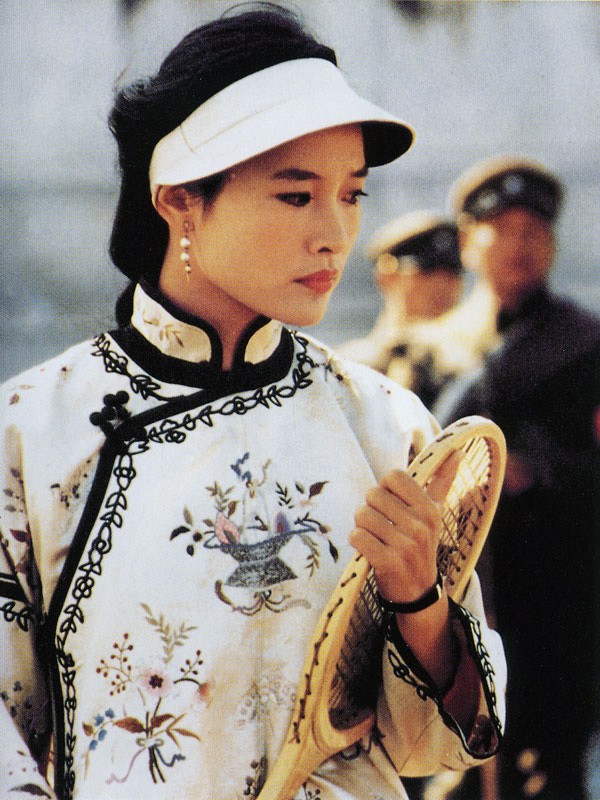 Joan Chen can make even a tennis visor look good. The Western military uniform was a compromise because he wanted to continue wearing Chinese garb but the Japanese wanted him to wear Japanese clothing during the occupation. unrelated note: I think I see where Lucas (or his designers) got ideas for Queen Amidala’s clothing in Episode I. 4th & 5th pictures from the bottom. Trystan, did you manage to see the Chinese costume exhibit at the Metropolitan Museum? Not to be missed! 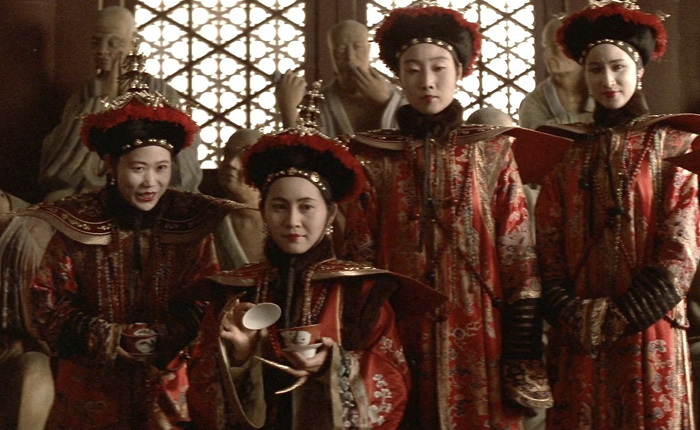 One section of it (on the ground floor exhibit rooms) uses this film to illustrate the Manchu robes used at the time in the royal court and western fashions influenced by them. Amazing movie. It’s interesting to see how the clothing changes throughout the life of Pu Yi. 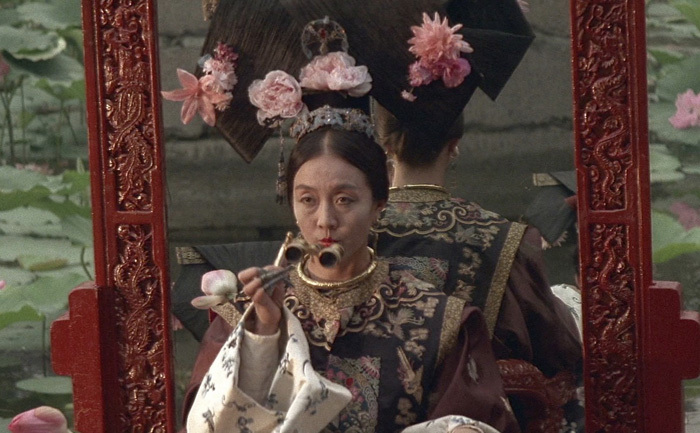 I sort of saw it when my mom was watching it, and it looked like a decent movie, but when you star watching historical dramas produced in China with all of their costumes and sets, it’s really hard to go back to western attempts at imperial opulence.